Walmart Asia Realty engaged Base Creative to provide market research, planning, brand creation, packaging design, and brand activation for its new integrated mall in Zhuhai, China – the first of a planned chain. After conducting extensive consumer trend research, Base Creative designed the three mascots – Mr. Happy, Mrs. Happy and Happy Baby – as a representation of The Mall’s family-and-community-oriented objectives. Brand identity also includes a vibrant theme song, reusable shopping bags, and the theme color green to complement Walmart’s CSR initiatives. Base Creative organized the grand opening of the mall on the 28th of May, attended by 150 VIP guests, including the Commerce Board of Guangdong Province, and an estimated 26,000-people traffic flow. 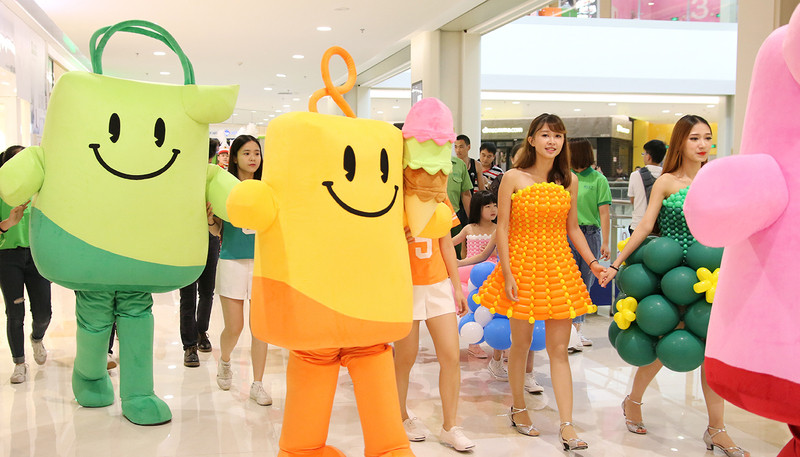 The ground floor lobby of The Mall was transformed into a green land where guests interacted, Walmart Asia Realty President, Peter Sharp, and Sam’s Club COO, Andrew Miles, gave their congratulatory speeches, and the three mascots gave out The Mall-themed balloons to children. The ceremony ended on a high note with a traditional lion dance and ribbon-cutting to signify good luck and success. Read more about the project on Walmart Project Highlights.